Troop 50's spring court of honor was an evening packed with activities marking the end of the troop year and the beginning of an equally busy summer Scouting season. The evening included the introduction of a first-ever court of honor taco bar, Order of the Arrow and youth leadership elections, the distribution of merit badges and ranks, and the announcement of the troop's recipient of the 2017 James J. Baird Jr. Honor Scout Award. 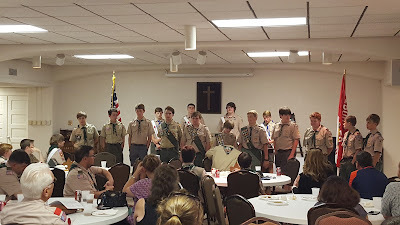 Scouts eligible for election to the Order of the Arrow gathered for consideration. 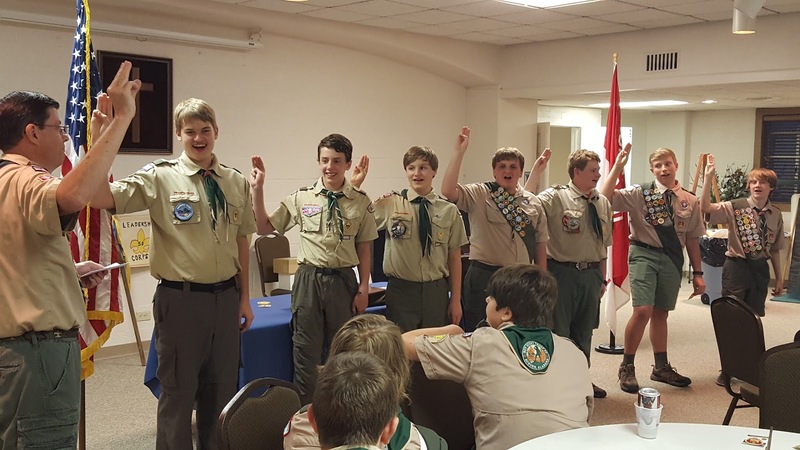 An election team of Scouts representing the Order of the Arrow's Chattahoochee Lodge conducted the troop's annual OA elections. Scouts who were eligible for election to the BSA's service organization and national honor society must have been under 21, earned First Class, experienced at least 15 days and nights of Boy Scout camping during the previous two-year period, including one long-term camping experience (i.e., summer camp), and received their scoutmaster's approval. Troop 50 Scouts who were elected will find out about their selection at summer camp or at another time during the summer in time to attend the lodge's summer induction weekend (also known as an Ordeal) Aug. 4-6. SPL Josh congratulates Hunter on earning his Star rank. 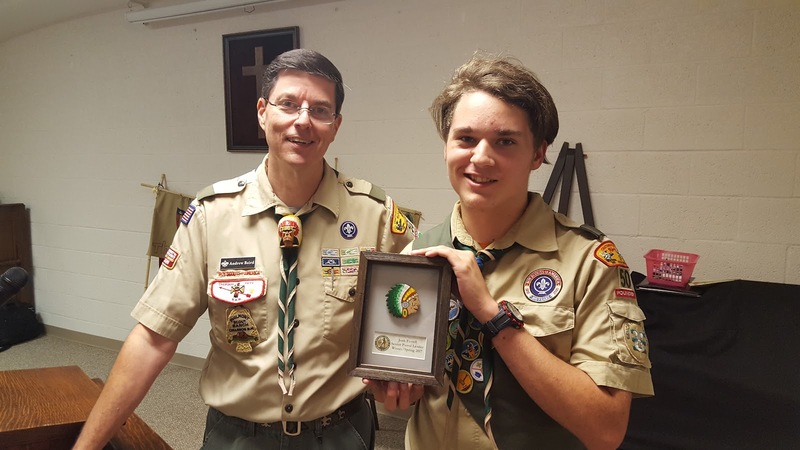 Senior Patrol Leader Josh and Scoutmaster Andrew Baird then awarded merit badges and ranks earned since the troop's last court of honor in December 2016. The spring court of honor included the presentation of eight rank advancements and 40 merit badges. Among the most popular merit badges presented was Fingerprinting Merit Badge, which Scout parent and Auburn Police Officer Bill Schallock taught during a February troop meeting, and Snow Sports Merit Badge, which Scouts earned in conjunction with the troop's annual trip to Gatlinburg in January. 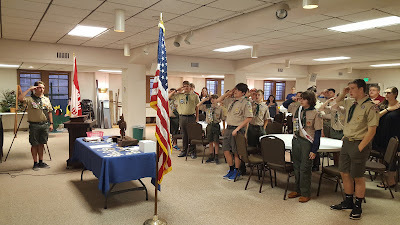 Scoutmaster Baird administers the oath of office to the troop's incoming class of youth leaders. At the start of the court of honor, in addition to electing candidates for the Order of the Arrow, Scouts elected the troop's youth leadership who will serve during the summer and the remainder of the calendar year. With the votes cast, Scoutmaster Baird distributed position patches and administered the oath of office to the incoming cohort of youth leaders, which included (group photo above, left to right): Senior Patrol Leader Jacob, Patriots Assistant Patrol Leader Miles, Patriots Patrol Leader Joe, Armored Armadillos Patrol Leader Michael,Troop Quartermaster Paul, Lead Troop Guide and Leadership Corps member Rusty, and Lead Troop Instructor and Leadership Corps member Aiden. Scoutmaster Baird also recognized outgoing Senior Patrol Leader Josh for his service by presenting him with a handmade neckerchief slide and display box. 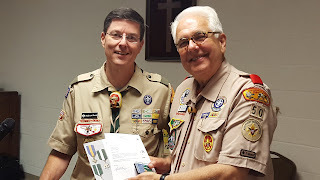 The final item on the agenda for Scout recognition was the annual presentation of the troop's James J. Baird Jr. Honor Scout Award. 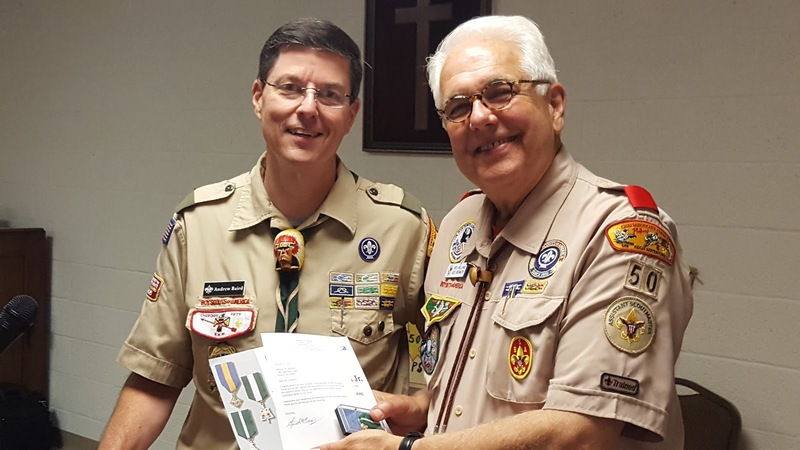 First presented in 2015, this award is given annually to the troop's "top Scout" based on his participation in troop activities, demonstration of Scout skills, continuing advancement success, and a vote of his peers. The award honors the memory of Jim Baird, the uncle of Scoutmaster Baird, a 1945 recipient of the Eagle Scout rank and longtime Rotarian leader. The award includes an engraved Eagle statuette, as well as a $100 credit to the honoree's troop activities account. 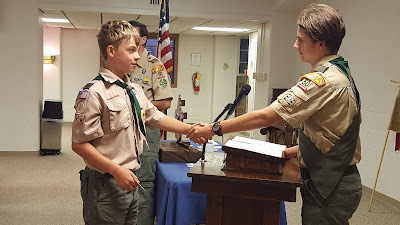 This year's recipient was Nicky, who was completing a term as lead troop instructor and will serve the remainder of the year as assistant senior patrol leader. He was unable to accept his award in person, since he was participating in an out-of-town session of the Boy Scouts' National Youth Leadership Training. Scout Leader's Training Award from Scoutmaster Baird. The evening concluded with one additional presentation: the Scout Leader's Training Award, which was earned by Assistant Scoutmaster Wes Williams. The award recognizes adult leaders who complete a number of required volunteer training courses and who provide specific leadership at the unit level and beyond. The court of honor marks the troop's last Monday-evening gathering until it resumes its regular troop meeting schedule on Aug. 7. Until then, troop activities will include a summer camp contingent to Camp Sequoyah in Delta, Alabama, from June 11 to 17, a backpacking expedition to Philmont National Scout Ranch in New Mexico from June 17 to July 2, and representation at the National Boy Scout Jamboree at The Summit Bechtel Family National Scout Reserve in West Virginia from July 18 to 28. The troop also plans its annual "Chill at the Lake" event for July 15. For more photos from the troop's spring court of honor, visit its online photo album.